This might be the best job coaching Mark Richt has done, as far as getting the team to play like a team and be better than the sum of its parts. We came into the season with a QB that has been praised for 'getting the most out of his talent.' We came in with two of our top receivers sidelined. We came in with a defense that was perilously thin, and one that the new DC was consistently and vocally not happy with. We endured another rash of injuries, and other things, that lead to us losing a whole team's worth of RBs. Still, Georgia is poised to lead the conference in scoring, improve 8+ points in scoring defense, and has fixed most of the special teams non-sense from the last four seasons. Bobo has done his best job yet in scheming, game planning, and coaching his players. Pruitt has done a good job with the players he thought weren't ready for his style of defense. Richt and his staff have done a stunningly good job of maximizing what this team can be. And that is what is so maddening. The two losses in conference were due to coaches not doing what it takes to win the game, as opposed to worrying about not losing. Richt, despite the fake kicks, going for it on fourth down, and breaking out trick plays, still, at inexplicable times, grasps onto the don't screw up mentality. The squib/pooch kick was just one example of that. 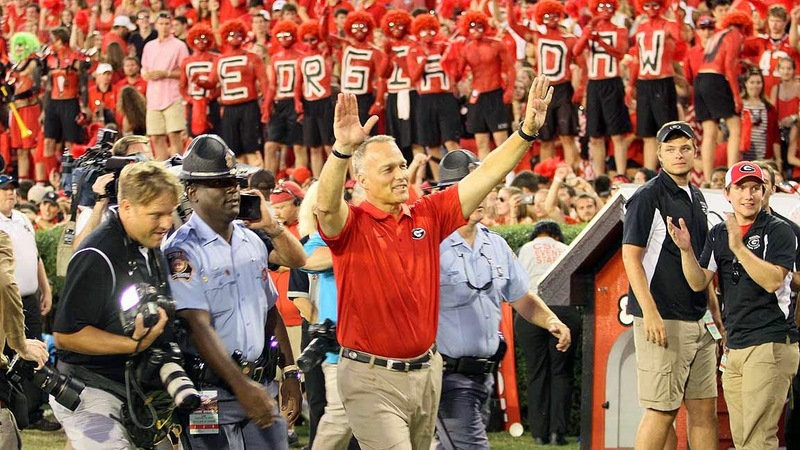 At this point, Mark Richt still can't recognize how to step into a situation where if things go wrong there isn't really that big a difference, but if they go right, there is a huge payoff. The key lesson here is to be clear on the difference between probability and consequence. The corollary to that is making decisions where things could go wrong, but aren't likely to do so. Call it Les Miles'ing. Les Miles really gets the distinctions noted above. And he wins games because of it. While it drives LSU fans crazy, and he definately carries it too far at times, he recognizes both the value in making decisions that carry more benefit when the lower risks dictate it, and know where things can go wrong, but aren't likely to do so. The difference is easily illustrated in the Tech game. Think about the series with the fake FG. Brilliant call. At worst we likely give up an average of 10 yards of field position to a team that, at that point, we were handling well. At best, we score a TD on the play, and nearly did. Georgia ended up not getting into the end zone and taking a FG. Why go for a FG there? We are averaging nearly 4ypc inside opponent's 20 and are completing 66% of our passes inside the red zone. If you are willing to risk turning the ball over to Tech at their 30, why not risk the same from their two in exchange for 4 more points, and so much more momentum? Same goes for the pooch kick. The payoff of kicking it deep is they have a long field against a higher possibility (though still low) of a TD return. By pooching it, you nearly eliminate the chance of a TD return, but substantially increase the chances of getting the ball into FG position. 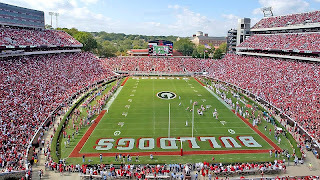 In both kicking the FG inside the three and the pooch kick, Coach Richt was trading the possibility of something bad happening for the immediate payoff of controlling of what happens, though with that control you are giving up a high payoff, and oftentimes one that has a much higher probability of happening than the bad thing happening. In poker parlance, he is checking down a winner, even though knows he is holding winner and his opponent is drawing to a one or two outer. This manifests itself in the bigger picture from our past reliance on the Gray hound for four years, consistently fair catching punts anywhere deeper our own 40. Or punting inside opponent territory on 4th down in short yardage situations. Or going for FGs inside the opponents 10. Richt has shed some of that super conservative, don't mess up pathology, definitely picked up from being at FSU when Bowden showed some of the biggest riverboat gambling tendencies in the game. He still reverts to it too often. Mark Richt has done a good job over the past few seasons of recognizing where he needs to change to 'take the next step.' It remains to be seen if he can do so with a much harder to recognize and easily fixable hole in his coaching game. This post is ...just...genius. I had to read it three times and then think about it. I've been wondering for years now how we seem to lay an egg two to three times a year against teams we should beat and then lay down the wood on teams we're not supposed to beat. Head scratchers. It always seemed like Richt and Co. would make these brainless, stupid calls that would cost us the game (not in the FL game, that was on the players). I, for one, am sick of the "aw shucks" apology after these games. I want to hear "I am never gonna do something that damn dumb again". Instead, we get "aw shucks" and then, they(the coaches) DO IT AGAIN! It seems the coaching staff needs some sports psychologying AND they need to stop making the same stupid mistakes over and over again. If we lose, it should be because of play on the field and not because a coach loses his nerve. I love me some Mark Richt, but come on man, get it together. Stop playing Peter, Paul, and Mary in your head and pull out the Metallica. Great insight and in my opinion, the best explanation of what is wrong with Georgia. Tyler - excellent article. Richt is way to conservative. He plays for three points way to often. Early in the SC game, we kicked a FG on 4th & short. Against FL, up 7-0, defense gets turnover & on 4 th & 2 from 23 ud line, we attempt & miss a FG. Both times were critical moments in the game. For UGA to have never faked a FG during his tenure is astounding! As he did in the AU game & against Tech, its OK to put confidence in your team & go for it on 4th & short. As for the QB play, this is now the 4th time a 5th year SR gets their only year of playing time. The first time with Shockley worked out great. The last three times have been failures. For most, there is a reason your sitting for 4 years. Also, after not plating for 4 years, the game has passed you by. This year was appalling because UGA had a favorable schedule. Then, when Gurley went out, we didn't miss a beat. We had 2 weeks to prepare for SC, FL & GT & lost all three! The kickoff return team is a clown parade & I'm not certain they are coached on what to do. Lastly, the pooch kick idea may be the worst decision in CFB history. To kick it short to a non throwing team in inexcusable. Then, to allow the QB to scramble for 23 yds AND get out of bounds is dreadful. I sometimes believe that Richt has become the Charlie Brown of CFB! 63-29 latest 7-year period # 20 won/lost record. It gets far worse, if you break down the wins vs ranked and losses vs unranked. Trust me.